Crest’s latest series delivers on our commitment to collaborate with clients to provide tailored, cost-effective solutions that meet your print, document management and content needs while helping you to meet your green objectives. A tablet-like, customisable user interface lets you enjoy the same sophisticated technology. 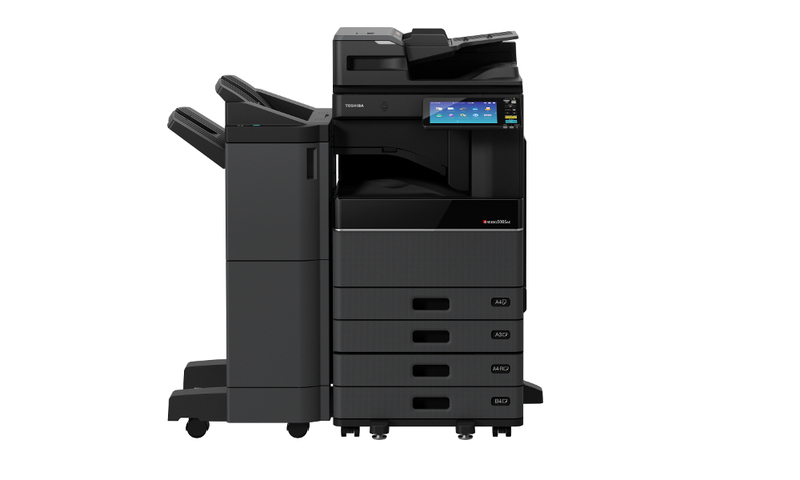 Deliver impressive document output at a speed of up to 85 ppm and cover all print, scan, copy and fax needs of modern businesses. The Toshiba e-STUDIO 3508A has a new high-quality 22.9 cm (9″) tablet-style multi-touch screen can be personalised according to a user’s preferences and needs. It starts with the background image, which can easily be exchanged and continues with personalised views. You can change the order of the icons on the home screen, add or remove buttons and decide how many icons should be displayed per page, so that all functions present themselves to you in a way most useful to you. The Toshiba e-STUDIO 3508A model fulfils the highest security standards to protect your data from unwanted access. So whether you are looking for document security, device security or access security – our new system has it all. Teams and divisions in any business need to get a lot more done often using fewer resources and minimal space. That’s the thinking behind the e-STUDIO 3508A, too. Plenty of functions, lots of capacity, and a small footprint with a fresh, new look.